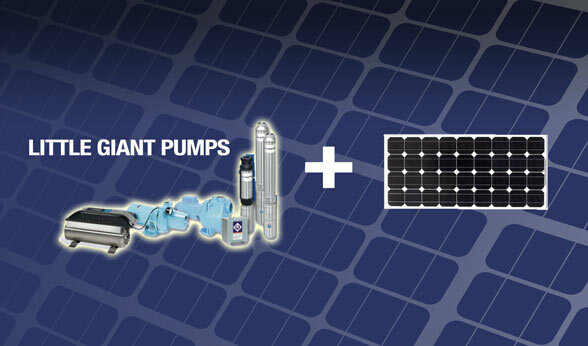 ...Little Giant Pumps & Agriculture Solar Powered Water Pump Power Increases Efficiency, Lowers Costs and Maintenance. We offer tailor-made solutions that work with you to create energy cost savings. Franklin Electric's Little Giant Pumps and Agriculture Solar specialize in the water transfer market with products including irrigation pumps and power supply. Integrated controls and protection, coupled with a proven Little Giant pumps and motor create a powerful, yet quiet, solution to most water well needs. Little Giant Pumps and Agriculture Solar are committed to provide customers with defect-free products through our program of continuous improvement. Quality shall, in every case, take precedence over quantity. This commitment to quality applies not just to our products, but to everything we do. The best products and services are useless if they are not available when and where someone needs them. Little Giant Pumps and Agriculture Solar's commitment to availability extends throughout the organization, at all levels. Little Giant Pumps and Agriculture Solar are committed to support our products and customers through industry-leading technical service, technical support and training, prompt and accurate answers to questions and handling of transactions, and timely follow-up on all matters. Little Giant Pumps and Agriculture Solar's commitment to innovation means that we will evaluate and incorporate new technologies into our existing products, services, and processes to continuously improve value to our customers. We do not search for avant-garde technologies purely for the sake of change, but instead embraces innovations and solid solutions that make a difference. When Franklin sets the industry standard for quality, availability, service, and innovation, the value offered by Little Giant Pumps and Agriculture Solar products will be second to none. At Agriculture Solar, Little Giant Pumps and Agriculture Energies can be your simple water pump solution. Founded in 1944, Franklin Electric has grown from a small motor manufacturing company into a leading global provider of complete water systems and fueling systems. Franklin Electric's principal markets include clean water want water transfer systems. Headquartered in Fort Wayne, Indiana, Franklin serves all corners of the world with more than 14 manufacturing and distribution facilities. Agriculture Energies systems have been dedicated to modern agricultural irrigation and successfully active in the top irrigation fields for over 10 years and continues to bring the tried and true principles and advantages of solar hybrid power. Think about it, and then make your move. Let Little Giant Pumps and Agriculture Solar water management provide you with decades of reliability and lasting value. We invite you to explore the possibilities of our reliable hybrid solar powered pump solutions.